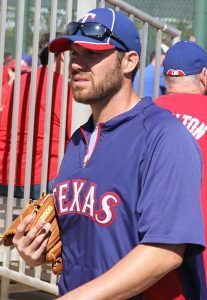 The Texas Rangers’ Colby Lewis took a perfect game into the eighth inning and a no-hitter into the ninth Thursday but had to settle for a 5-1 complete-game victory. Lewis lost his perfecto by issuing a two-out walk to the Oakland Athletics’ Yonder Alonso. He escaped the eighth with the no-no intact but lost it in the ninth on a leadoff double by Max Muncy.